Smoke stalks; poisonous gas is in pursuit. Indonesia is on its knees again. Levels below the fiery lava. Pound with running, escaping, burning feet. 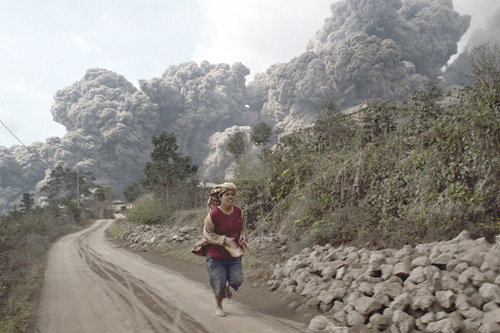 This entry was posted in Uncategorized and tagged death toll, disaster, eruption, escaping, February 1-2014, fleeing, Indonesia, Karo district, Mount Sinabung erupts, mountain, North Sumatra, running, Sigarang-Garang village, villagers, villages, volcano, warnings. Bookmark the permalink.